ATLANTA (AP) Julian Gressel tied it in the 56th minute and Atlanta United held on for a 1-1 draw with the Portland Timbers on Sunday. A loose ball deflection off defender Larrys Mabiala bounced into Gressel’s path and he pounced on it with a right-footed volley. Atlanta (10-3-4) stayed atop the MLS standings and extended its unbeaten streak to five games. Mabiala opened the scoring in the 32nd minute. Samuel Armenteros was the first to get a touch with a left-footed stab on Diego Valeri’s free kick. Goalkeeper Brad Guzan blocked it out, but Mabiala headed home the rebound and Portland took the early lead. 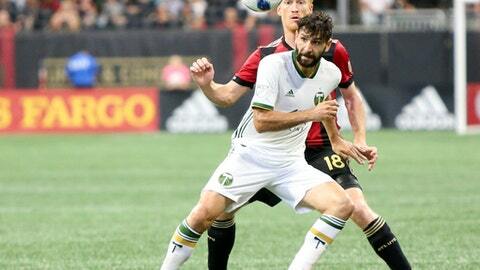 The Timbers (6-3-5) extended their unbeaten run to nine. NEW YORK (AP) – Jo Inge Berget scored twice and coach Domenec Torrent celebrated his New York City FC debut with a victory over Toronto FC. Berget made it 2-1 in the 68th minute, following Maximiliano Moralez’s direct pass up the right channel and slotting it home. NYCFC (9-3-4) tied it at 1 in the 51st minute on Berget’s back heel from the top of the 6-yard box. Vitor Vazquez opened the scoring for Toronto (4-8-3) in the 37th minute. Torrent replaced Patrick Vieira in New York shortly after Vieira’s departure for OGC Nice was officially confirmed.